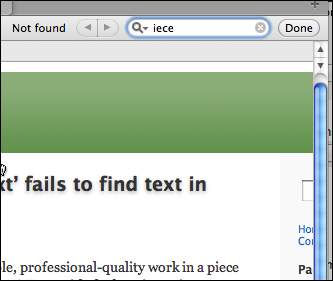 As you can see, when I ask Safari to look for the text string “iece” in the web page, Safari fails to find any occurrence of the text string, even though it is clearly there as a substring within a word such as “piece” (at the end of the first line of the blog post). I can confirm that Safari 5.0 has no trouble finding such substrings. But Safari 5.1 fails to find them at all, unless they occur at the beginning of the word. This menu and these options didn’t exist in Safari 5.0. It’s not exactly an obvious change, so I didn’t notice it. Thanks to reader Joachim for pointing it out to me. If you select “Contains,” the search works the way it used to in Safari 5.0, so all is well… except that it’s hard to understand why Apple would have chosen to use “Start With” as the default option without warning users about this. UPDATE 2: Joel now has a post about using the command-line defaults to change the default behaviour. This entry was posted by Pierre Igot on Tuesday, August 9th, 2011 at 6:25 pm	and is filed under Macintosh. You can follow any responses to this entry through the RSS 2.0 feed. Responses are currently closed, but you can trackback from your own site.